I’m going to introduce a beautiful Korean rice cake today. It’s called mujigae-tteok (무지개떡). Mujigae means rainbow, so my ancestors must have got the idea for the name from a rainbow! I love it! This is an example of how they incorporated natural beauty into their everyday life. 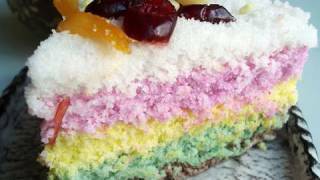 Even though the name of the rice cake is “rainbow rice cake,” it is usually made with only 3-5 different colored layers. That’s why this rice cake is sometimes called “colorful rice cake” (색떡, saektteok). In this recipe, I am using 5 different colors from bottom to top: brown, green, yellow, pink, and white. Leave a comment and let me know what you wish when you make this! A note about short grain rice flour: the flour you buy at your local store or the flour you make may have more or less moisture in it than the rice flour I use in this recipe. This is because of many different things like how long it’s been in the freezer in the store, or the atmospheric conditions where you live. You may need to steam more or less, depending on how dry or wet your short grain rice flour is. 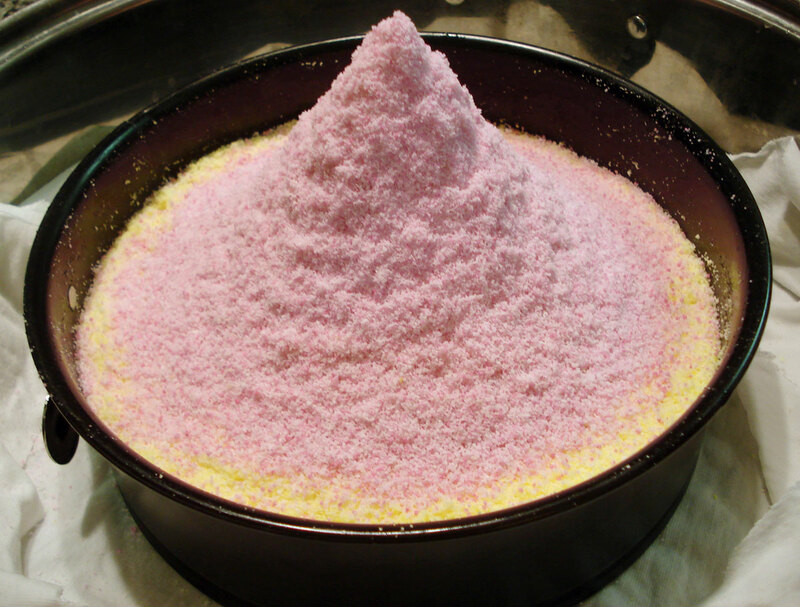 A 2 pound package of frozen rice flour (or make it at home), sugar, salt, water, liquid food coloring (green, pink, and yellow), lemon, mugwort powder (ssukgaru 쑥가루), cocoa powder. Steamer, sifter, 8 inch (20 cm) ring or springform. Thaw out frozen rice flour package and put it into a large bowl. Add 10 cups of water in the bottom of a steamer, and place a wet cloth over the rack. Place the 8 inch cake ring in the center of the rack. Place 1 cup of rice flour in a medium sized bowl. 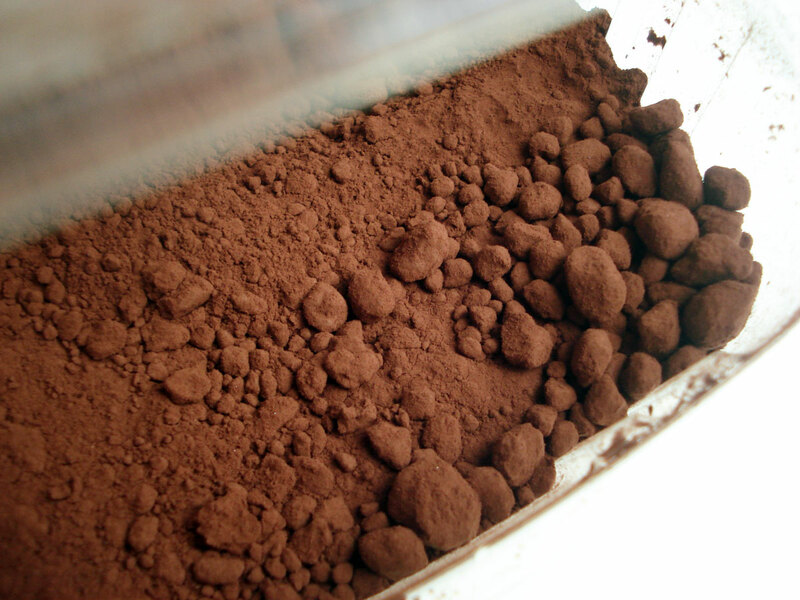 Add 1 ts cocoa powder, a pinch of salt, 2 tbs of white sugar, and 4 ts of water. Mix it all up and press out any wet lumps by rubbing the lumps gently between your palms. Put the mixture into a sifter and sift into the center of the ring. Flatten out the mixture so it sits level in the ring. Place 1½ cup of rice flour in a medium sized bowl. Add a pinch of salt, 2 tbs sugar, and 1 ts mugwort powder (ssukgaru). Put 2 tbs of water and 1 drop of green liquid food coloring into a small bowl and mix well. Add the green water to the rice cake mixture and mix it all up. Press out any wet lumps by rubbing the lumps gently between your palms. Place 1½ cup of rice flour in a medium sized bowl. Add a pinch of salt and 2 tbs sugar. Put 1tbs lemon juice, 1 tbs water, and 1 drop of yellow liquid food coloring into a small bowl and mix well. 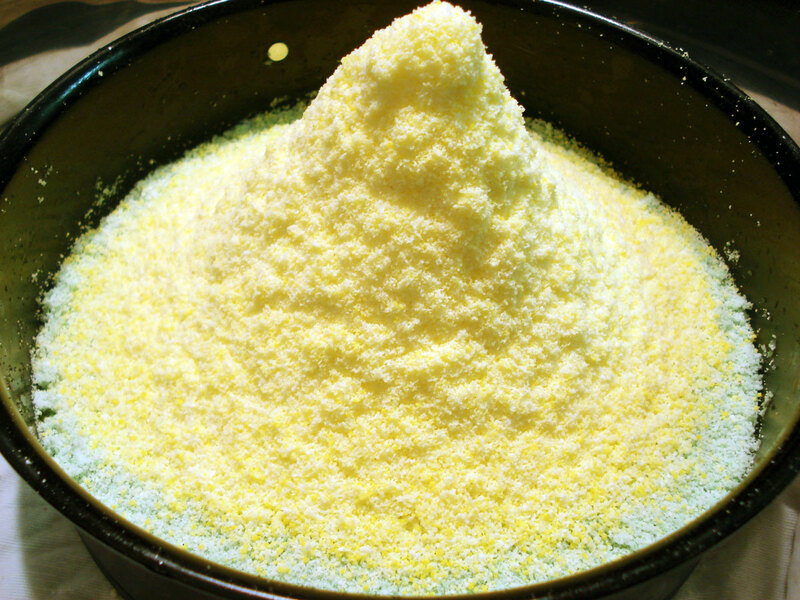 Add the yellow water to the rice cake mixture and mix it all up. Press out any wet lumps by rubbing the lumps gently between your palms. Put 2 tbs water and 1 drop of hot pink (fuchsia) liquid food coloring into a small bowl and mix well. Add the pink water to the rice cake mixture and mix it all up. Press out any wet lumps by rubbing the lumps gently between your palms. Place 1 cup of rice flour in a medium sized bowl. Add a pinch of salt, 2 tbs white sugar, and 4 ts water. Mix it up and press out any wet lumps by rubbing the lumps gently between your palms. On the top of the cake place 5 dried cranberries to make flower petals. Put a few pine nuts in the center. Cut a dried apricot into a thin strip, and place it as a flower stem. Close the lid of the steamer and bring to a boil for 30 minutes over high heat. Turn down the heat and simmer another 5 minutes. Take out the rice cake and let it cool down. Serve with tea or coffee. Posted on Saturday, November 7th, 2009 at 3:25 pm. Last updated on August 7, 2017. Posted July 23rd, 2017 at 6:45 pm | Log in to reply. Many thanks for sharing your love of cooking. What kind of rice flour; is it gluten rice or just rice flour as I cant get frozen rice flour in uk. Can I use this one? Posted June 8th, 2017 at 5:17 pm | Log in to reply. I went to a Korean grocery today. They have two kinds of frozen rice – regular rice and sweet rice. I bought the sweet rice. Should I have bought the regular frozen rice? I want to make the steamed rice cake but I’ve noticed the recipe does not specify if it’s using the rice flour made from regular or sweet rice. Thanks. Posted June 9th, 2017 at 12:16 am | Log in to reply. Posted June 9th, 2017 at 12:49 am | Log in to reply. So I made this today. It did not turn out the way I expected. I already used 1/2 the sugar called for in the recipe because I was using sweet rice and it was still far too sweet. The consistency was very sticky as well, not at all like the rice cake I had bought in store. Even though I had steamed it for 3 minutes it had an odd uncooked consistency to it. Not sure how to explain it any better. I made it 3 layers – matcha green tea, plain white, and a brown layer using Japanese black sugar. The flavors were good, albeit toooooo sweet. Live and learn. Now that I have approximately 1.75kg of the sweet rice flour sitting in my freezer, what else can I make with it? That’s supposed to say 30 minutes, not 3 minutes. Posted January 27th, 2017 at 1:58 pm | Log in to reply. Has anyone ever used a pressure cooker/instant pot for this? If so- what’s the cooking time? Posted January 28th, 2017 at 8:04 am | Log in to reply. The instruction manuals say not to cook rice in a pressure cooker. Posted January 6th, 2017 at 5:39 pm | Log in to reply. I want to make a rice cake for my Korean daughter in law’s birthday. She loves coconut so I would like to make it coconut flavoured. Can I add shredded coconut to the rice mix? If so how much? Posted January 11th, 2017 at 11:33 pm | Log in to reply. I did a small test and it worked. I followed your directions for the white layer and added 1/4 cup shredded dried coconut to 1 cup of rice flour. I couldn’t sift it though because of the coconut. When I make the full cake on Saturday I will sift it into a bowl and then add the coconut and put it in the pan. The coconut flavour was delicious! Thank you so much for your inspiration Maangchi! Posted August 20th, 2016 at 3:35 am | Log in to reply. Hi Maangchi, I love your recipes. Thanks for posting them. I wanted to know if I can use Mochiko Rice Flower for the Rainbow Rice Cake? Posted August 21st, 2016 at 11:36 am | Log in to reply. No, mochiko flour is made from glutinous rice flour which is much stickier than short grain rice flour. If you make this rice cake with mochiko, it won’t turn out fluffy. This recipe was originally posted on November 7, 2009 at 3:25 pm by Maangchi. It was last updated on August 7, 2017. The video was watched 1,292,404 times on YouTube & has 10,475 likes!